If you have been trying to keep up with the latest fitness trends you will have noticed that there is one predominate battle. The Clean Eater vs. The Flexible Dieter. Let’s start out by answering who the hell these people are. A clean eater is typically someone who consumes their Calories from whole foods. They will try their best to make sure each food item has one ingredient in it. They fear the evil toxins that are in all of this “junk food” that is on the market today. They know that their body does not recognize these new foods in the supermarket and will simply store it as fat. On the other side, a flexible dieter is typically someone who couldn't give two shits about what they eat as long as their macros add up at the end of the day. Another common name for flexible dieting is “If It Fits Your Macros,” IFYM. Flexible dieters are obsessed with three numbers: protein, fat, and carbohydrates (these are your macronutrients). Ice cream, fast food, cookies, hey, if it fits your macros right? Wow, that was aggressive. My apologies for offending any people from either side. I am merely giving out bias stereotypes by the contra-side. One of the problems with clean eating is that no one really knows what these "clean foods" are that everyone is talking about. Is fruit clean even though it is high in sugar? Are nuts clean even if they are high in fat? If you put a handful of experts in Nutritional Science in a room they will debate this definition endlessly. At the end of the day, clean eating will take on a much more individualized meaning. If the individual is a strong advocate for the paleo diet, than all paleo foods will be considered "clean foods." Likewise, if the individual is vegan, all vegan foods will be considered "clean foods." What even are clean foods? Flexible dieters experience a similar dilemma where not many people quite understand what they are doing. Flexible dieting is a skill that is acquired over time. You need to truly understand portion control in order to not over or underestimate your Calories. You also need to keep a food log where you continuously track your dietary intake. This food diary should emphasize the amount of Calories, protein, fats, carbohydrates, and fibre that you consume. I know fibre isn’t one of the magical macronutrients, but it plays an important role in our body. Fibre is an important nutrient that helps move along our digestive system, lower cholesterol, improve our blood lipid profile, balance blood glucose and insulin levels, and helps us feel full (Slavin, 2008). 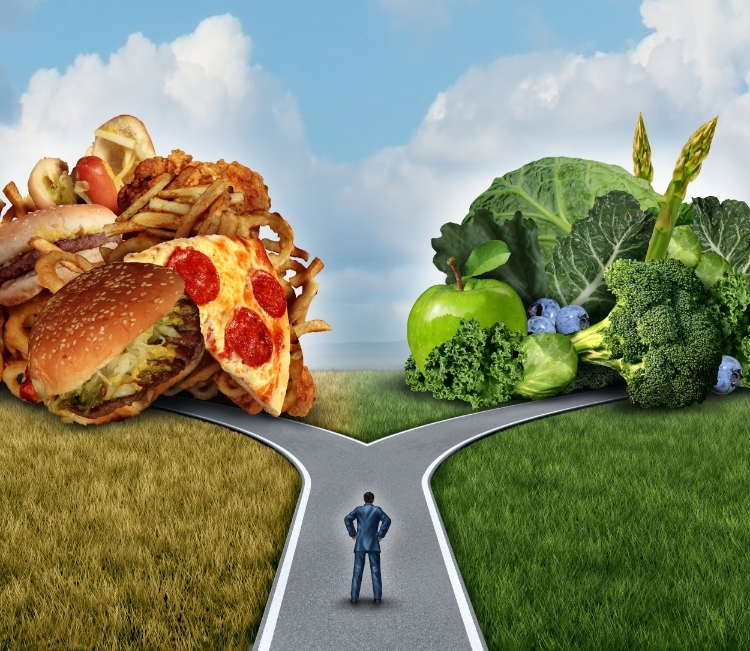 Now let's take a minute to go through some of the similarities and differences observed in both diets. Flexible dieters are mindful about their fibre intake. Foods that are high in fibre are vegetables, fruits, oats, whole grains, and lentils. Many clean eaters would approve of these food choices. The reality is flexible dieters will not be able to hit their daily goal for fibre and protein if they are eating junk all day long. Flexible dieters will have to find a way to eat an adequate amount of whole foods. Ah, the cheating window. This is a magical time in a clean eater's week where for one meal or one day their diet does not matter. They can eat whatever they want. They are under the impression that this is good because it will reset their metabolism to a normal fat burning zone. During this window a clean eater will eat all of the junk food that they have been craving. This can result in all out binges of food, consuming in the thousands of kilocalories. Flexible dieters also eat junk food, but they do it in a steadier way. Instead of reserving a magic time period, they will indulge when they feel like it as long as the other parts of their diet are in check. Both sides love to fight with each other! Too often the general population (as well as fitness professionals) gets swept up in some “revolutionary” type of training or diet. Flexible dieters will accuse the clean eaters of having eating disorders because they can’t eat junk food, and clean eaters will accuse flexible dieters of not being strict enough with themselves. The end result is countless #IFYM and #cheatday Instagram posts. Clean eating can have some negative impacts on the mental aspect of the dieter. Flexible dieters accusing the clean eaters of having an eating disorder is a valid argument. This is known as orthorexia nervosa and applies to people who are obsessed with eating healthy foods. To date, orthorexia nervosa is not a recognized eating disorder by the American Psychiatric Association (Parekh, 2015). However, there has been a great deal of research done on this style of eating over the last ten years and it is in my opinion that the American Psychiatric Association will eventually recognize it as an official eating disorder. Orthorexia can be a harmful behavior where individuals start developing a polarized way of thinking where chicken, broccoli, and rice is nirvana and a pop-tart is the devil. It is an obsession with the quality of food whereas anorexia and bulimia is an obsession with the quantity of food. Orthorexia is also related to social isolation, obsessive-compulsive disorder, and perfectionism (Brytek-Matera, 2012). Many individuals hypothesize that the flexible dieting strategy does not ensure adequate intake of micronutrients (vitamins and minerals). There is a significantly greater amount of nutrition in 100 kilocalories of sweet potato as opposed to 100 kilocalories of ice cream. However, various studies have shown than flexible dieters have smaller rates of nutrient deficiencies when compared to the clean eaters. This could be because people who try to eat clean eat an exclusive diet. By restricting themselves to only a few types of foods they become deficient in various nutrients. When people eat a diet with a great deal of variety they tend to be less nutrient deficient (Calton, 2010). It should be noted that it is incredibly difficult to obtain the recommended amounts of all of the micronutrients. For this reason, it may be beneficial to take advantage of multivitamin supplementation (Ward, 2014). In an effort to improve the quality of your life by eating only clean foods, you put yourself at a high risk to hurt your relationship with other people. Food is how people come together and socialize. It is how we form great memories and plays a vital role in our society today (Counihan & Esterik, 2013). This is not something that is worth sacrificing. People who go about the clean eating trend face many social dilemmas. When invited to a social gathering there are a few options that they have to chose from. One option is to turn down an invitation to a party and chose to isolate in fear of the food that is being served at the party. Another option is to go to the party but stand awkwardly in the corner as everyone else enjoys indulging in the delectable food prepared. Their final option is to take advantage of a “cheat meal” and binge at the party. They will leave the party feeling bloated and terrible about themselves. In turn, they will purge. A purge does not have to involve self-induced vomiting. Their purges are typically centered around intense exercise or restriction of food in the following days. But there is a fourth option that I left out. You can switch over to a flexible dieting lifestyle. You see if you prepare for the party by eating enough fibre and protein beforehand, you will feel more full at the party and not feel the need to binge. You will also be able to have some of the fun foods like pastries and pizza as they fit into your diet plan. After the party you won’t feel guilty and feel the need to punish yourself in the gym. You enjoyed yourself, you made some memories, and you did not over-consume on food. In conclusion, I have taken the side of flexible dieting. I do not like restricting any type of food unless there are obvious medical reasons. For example, if you have celiacs disease, there is the need to eliminate gluten. However, if you claim to be “gluten sensitive” I would like to investigate how you came to this conclusion as many have been swept up in this recent fad. Likewise, if you have a strong belief in animal rights and do not believe that they should be used as a source of food, I will support you in your vegetarian or vegan diet. This is directed at the general population who will wake up one morning thinking they will lose 50 pounds by going on a ketogenic diet. The best diet will always be the one you can maintain the longest. Flexible dieting is a skill that can be used appropriately throughout your life. It has the strongest relationship with “the absence of overeating, lower body mass and lower levels of depression and anxiety (Smith et al, 1999).” Clean eating is a diet that is not maintainable and lacks the scientific background to support many of the claims it makes. "Flexible dieting has the strongest relationship with the absence of overeating, lower body mass and lower levels of depression and anxiety"
Brytek-Matera, A. (2012). Orthorexia nervosa–an eating disorder, obsessive-compulsive disorder or disturbed eating habit. Archives of Psychiatry and psychotherapy, 1, 55-60. Counihan, C., & Esterik, P. V. (2013). Food and culture: A reader. New York: Routledge. Smith, C., Williamson, D., Bray, G., & Ryan, D. (1999). Flexible vs. Rigid Dieting Strategies: Relationship with Adverse Behavioral Outcomes. Appetite, 32(3), 295-305.